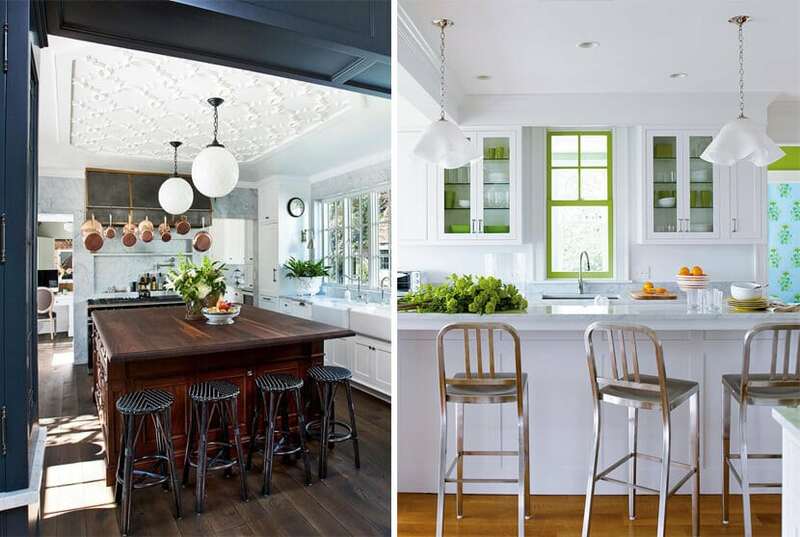 Kitchen Design Ideas | 5 Great Tips for Any Budget! The decision to install a new kitchen is a big one, both financially and emotionally. But how do you know if the kitchen design that you envision, is going to be great? 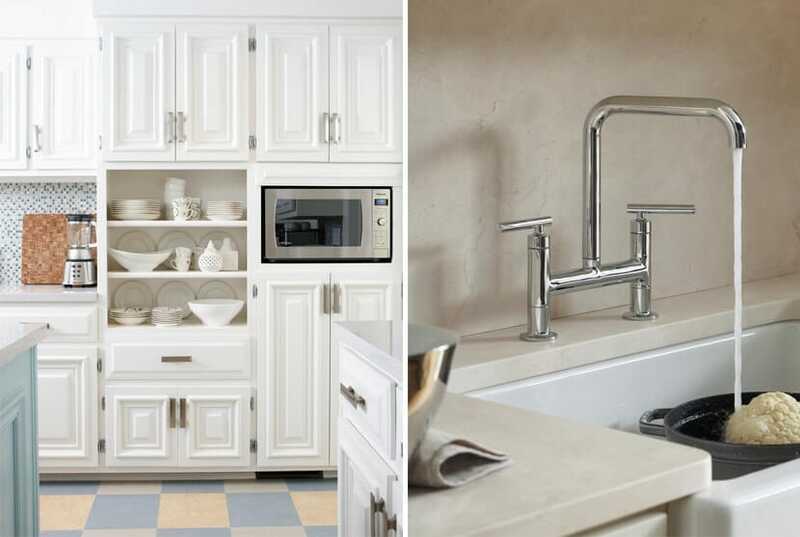 We’ve put together a checklist of things to consider when you are planning your new kitchen. If you take all of these points into account, you’ll be well on your way to an inspiring, well-designed asset to your home. The Golden Triangle: This is a term that was developed in the 1940’s to minimize unnecessary movement in the kitchen. 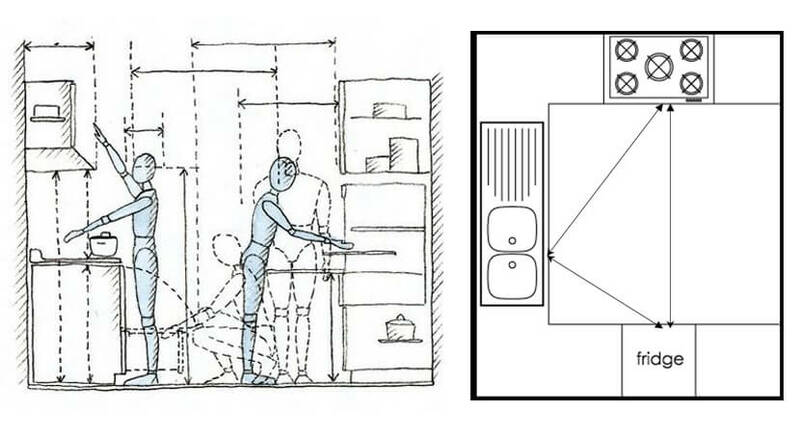 It proposes the ideal dimensions between the 3 hubs in the kitchen: the fridge, the oven and the sink. No leg of the imaginary triangle should be less than 1.2m and more than 2.7m long and there shouldn’t any object obstructing the flow between the hubs. Heights and Depths: Countertops should at a height of 910mm and tables at 740mm. Overhead cabinets should be reachable with the highest point being less than 1580mm and higher shelves being used for rarely used items. 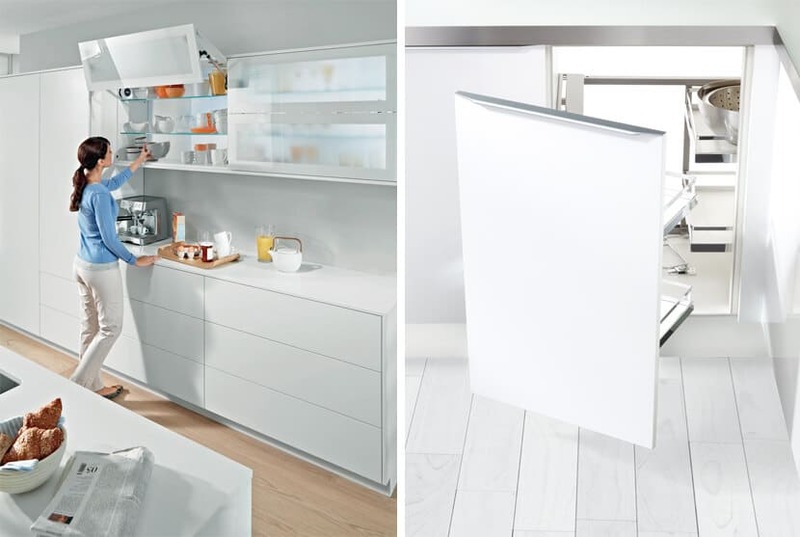 The maximum depth of a low cabinet should be 660mm to enable you to reach the back. Clearance: The width of walkways should be a minimum 1050mm, which will allow clearance for the fridge, oven and cabinets to be opened. A functional kitchen is one that allows you to do the job easily and without effort. This means that everything is within reach, the space is easy to clean and has all the necessary equipment for you to complete the task at hand. Finishes: A clean kitchen is the key to a great kitchen. Make sure that you choose finishes that are hygienic and can be cleaned with minimal effort. Non-slip floors are essential for the inevitable spills. Waste: Bins are necessary items that should ideally be hidden away in a pull-out cabinet. Ensure that you have a covered bin close to your main work station or island for food waste and recycling bins if you require them. Lighting: Adequate lighting, both natural and artificial, are essential – especially over the main work station and hob. See our post on natural lighting here. Ventilation: Aside from being a health and safety requirement, it also helps to eliminate strong food smells wafting through your home. Appliances: The amount of kitchen appliances on the market are staggering. Make sure that you allow enough storage space for smaller appliances and only purchase what you know you will use. A kitchen tends to be the room in the house with most storage space. Make the most of that space by installing solutions that optimise the available space. Electrical Points: it really is worthwhile spending a bit of extra time on the planning of power points. Consider where you will be using the toaster, the blend stick, the kettle and the food processor and place them accordingly. Pot Drawers: a very practical way to utilize lower cabinet space and easily store larger items like pots, pans, trays and bigger dishes. Carousals: get to use all the space inside a corner cabinet with these clever inventions. They come in a slide-out version or one that simply revolves inside the cabinet to allow you to reach everything. Midway Railings: keep counters clear without having to open a cabinet to get a spatula or kitchen towel. Shelves and baskets: great for storing odd items like the ironing board and iron or to have a spice rack next to the hob, they are mounted on the inside of cabinet doors. For more great storage solutions, visit Häfele. When designing a new kitchen, you should take into account all the different activities that you and your family use the room for. Do you have kids and what are their ages? Safety is essential when it comes to younger kids while older ones might require a homework area. See our post on designing kitchens for little kids here. 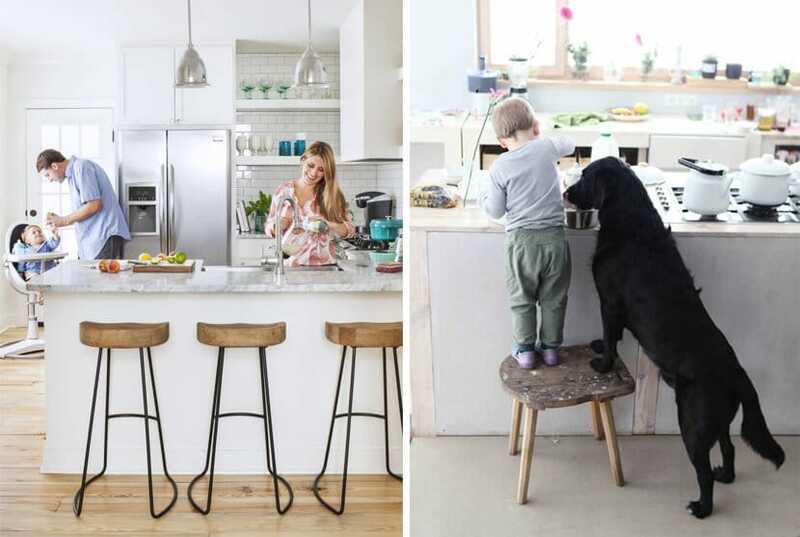 If you enjoy meals together as a family you can also install a counter, breakfast nook or simply have a kitchen table. Do you entertain regularly? Then think about how many people will be working in the kitchen at the same time. If you have an open plan kitchen, a separate scullery is also a great advantage to store dirty dishes during parties. Do you have pets? Pets are often fed in the kitchen, so food storage, bowls and their sleeping baskets should get a dedicated place. A kitchen is a big investment and while trends come and go, you are likely to have your new kitchen for the next 20 years. Like with any room in your home, the basic structural items will be around for a while. But you do have some flexibility in smaller item that can easily be changed over time. Style: this is probably the most important consideration. Choose something that will go with the style of your house. And unless you are certain that you will still love all the added details in the long run, rather opt for something simpler. Colour: while colour is not the most difficult thing to change, it can have a big cost implication.Choose a neutral colour palette that you can dress up with colour in the tiles and accessories. Finishes and Fixtures: go for the best that you can afford. It is an investment that will add to the value of your home.